Coming up with stocking stuffer ideas for kids is my biggest challenge every year. It’s getting even harder as my son gets older! When I was growing up, my stocking always combined a mix of things I needed and things I wanted. For example, my mom would give me deodorant, socks, shampoo and toothpaste along with candy and other treats. Best of both worlds. Now that Jacob is getting older, I plan to do the same for him. I figure kids are more likely to want to do things like take a bath, brush their teeth and stay hydrated if they get to unwrap a present that helps them do it! Take a look at 5 healthy stocking stuffer ideas for your kids! Affiliate links included below. Your support is awesome, thanks so much for it! Jacob received the Panasonic Battery-Operated Kids Toothbrush for review around Halloween and has been using it since. He likes it better than his other toothbrushes because it’s super gentle on his gums. He also really likes the smaller head design. The Panasonic toothbrush pulses at 12,000 brushstrokes per minute, so it really gives your kids’ teeth a deep cleaning. Since Jacob’s dentist reprimands us every time we go, that’s super important to us. The Panasonic toothbrush even has a really cool LED light so you can see into the back of your child’s mouth! That’s pretty handy when you’re trying to check out a loose tooth! Kids can turn it off with a click of a button. We’ve been running the Panasonic toothbrush on the same AAA battery for a month now, so you won’t be going through batteries like crazy. It comes in pink and blue and features a subtle yet cute bear design on the cap. Grab it on Amazon for $28.97. It normally retails for $39.99, so that price may change. We received a selection of AquaBall waters for review. Getting kids to drink water is much easier when it’s both tasty and adorned with their favorite characters. AquaBall Naturally Flavored Water is both. It’s actually the very first and only flavored water just for kids that has absolutely NO sugar or calories. It’s also the only water beverage that meets Disney’s nutritional guidelines and has received their “Mickey Check” seen on every bottle. Because of that, Disney allows them to feature your kids’ favorite characters on their bottles! 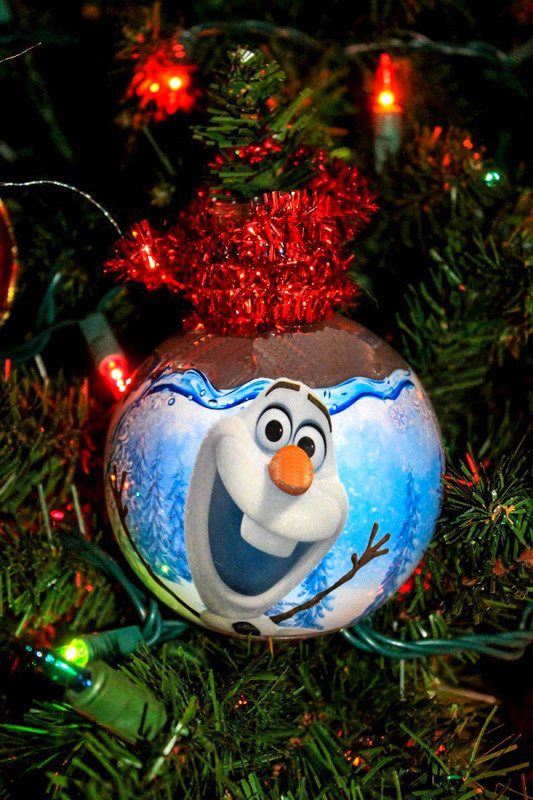 AquaBall Waters are actually the perfect shape for Christmas ornament crafts! With the cool character designs, you can even use them almost as-is to decorate your tree. Almost. I suggest using a dark permanent marker (I used silver, although it’s showing up red in the picture) to color over around the design and cover the nutrition information and whatnot. Then wrap a ribbon around the top and hang it up! Kids need to bathe, right? Bathing is sooo much more fun with bubbles, right? Natural bubble bath is way better than, say, chemical-laden bubble bath, don’t you think? Kiss My Face makes a variety of fantastic bubble baths for kids that smell oh-so-yummy. In fact, you may just be tempted to steal them for yourself! They contain no parabens or artificial fragrances, and are gentle enough for kids ages three and up. So, these are cool, right? I found the Slim Snack when I was searching Amazon for healthy stocking stuffers. They were actually one of the few things that popped up that made sense. The other results were, well, confusing. 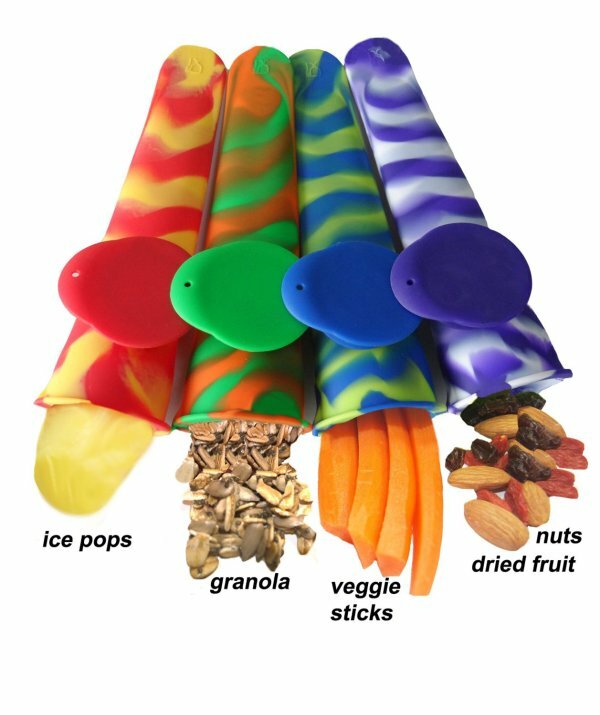 They are both snack bags AND Popsicle maker things all in one. They’re thin enough to pop into my son’s backpack without adding bulk, and they’re oh-so-stylish! 100% BPA-FREE food grade silicone, a safe, reusable alternative to plastic. The only silicone snack bag with a Patent Pending attached cap so kids can’t lose it and guaranteed not to leak. Really, anything that gets kids active and fits in a stocking will work. Jump ropes fit the category perfectly though. I was going to share a super cute Frozen Jumprope, but it’s like $10! I think it’s through a 3rd party seller. That can’t be right for a jump rope, can it? So instead, I found the pictured jump rope that super cute and costs under $4. 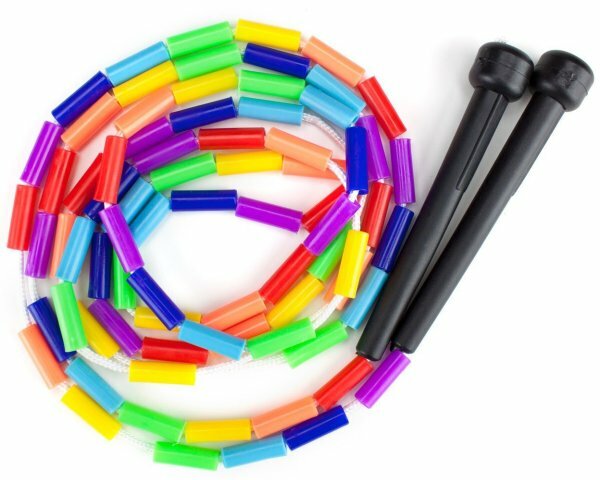 It’s a 7′ durable nylon jump rope with shatterproof 15/16″ plastic segments. Apparently, the plastic beads make it easier to go faster? I think they also make it more fun looking, which means my son is more likely to use it. So there you have it: 5 healthy stocking stuffers for kids to go along with all the treats and goodies they’ll also be getting! Do you have any other ideas for stocking stuffers? I really need a hand here! I found some cute bath items at Walgreens, including a $2 tube of My Little Pony shower gel and a $1 Minnie Mouse soap. They have an entire endcap display of such items.